What is it that makes us able to make wise decisions in almost any situation? It is not only the information that surrounds the situation, but also being able to synthesize the information through critical thinking. What might be a great solution in one place and time might lead to disaster in another place and time. With a push of a button we are all drowning in an ocean of information, yet global challenges continue to mount. It is the critical thinking part of the equation that is missing in our education. Everyday there is more evidence that children below the 8th grade should have very limited screen time, in fact the children of the people who were developers of electronic devices, such as Steve Jobs and Bill Gates, placed limits on the time their own children spent on devices. By limiting the constant flow of information from computers time is freed up for building the skills of critical thinking. In our younger years we develop much of our habit life as we mimic the adults around us, and the more we practice these societal skills the more they become habits. These habits that we learn as children can be a double edged sword. Societal habits enable us to engage with society without conscious awareness which leaves us free to utilize our minds towards other thoughts. On the other hand, habits that are so ingrained are hard to change, especially the older we get. When we consider the collective habits (paradigm) that are used by society it is no wonder that change comes about slowly. Radical change can occur when many of the ingrained societal habits no longer work as societal challenges begin to mount. Within our collective society there are sub cultures that have different societal habits which divide the population. This division can be a result of race or religion, but much of the time it’s due to income disparity. Much of our habit life is due to our family’s income level and the income level is at the heart of the educational divide. If we consider that money is exchanged for resources then the wealthier neighborhoods will naturally have a greater resource base to work with. Affluent parents expect their children to go to college and afterwards secure a well-paying job (cultural habit). The perception that this is the only path has been supported by the data that shows where college graduates earn more money than non-college people. In the past few years, however, college loans have escalated and more and more graduates are not finding jobs that earn enough to actually pay back their loans. There is another whole set of society that cannot imagine how they would ever go to college. In poorer neighborhoods access to resources is limited and expectations for further education is lower so the percentage of students able to envision such a future is diminished. In other words, wealthier schools instill the habitual perceptions that enable students to access more resources as an adult than poorer schools. If your parents are poor the deck is stacked against you making it harder to be successful in our high resourced based society. In 1997 Vermont made steps to remedy this situation by passing Act 60. At the time Windhall, VT was spending $12000 per student while East Haven, VT was spending $5800 per student on education (“America’s Newest Class War”, Mother Jones, by David Goodman, Sept/Oct, 1999). Act 60 required Vermont communities to put money into a statewide fund to be used to increase the money spent per student in poorer communities. I remember this time period as a great step in education, however, the wealthier communities were referred to as “gold towns” which at the same time divided the towns into the haves and the have nots. A report presented by Vermont Public Radio (“New Data: Vermont Graduation Rate Rising, College Enrollment Lags”, presented on Here and Now, by Charlotte Albright, Dec. 17, 2014) illustrates the discrepancies in regards to education of wealthier verses poorer communities. In spite of Vermont’s steps to equalize educational opportunities the graduation rate of students of poorer communities was 75.2% while the state average was 86.6% in 2013. There are many factors (military, climate change, social unrest, etc.) that are now limiting society’s access to resources for positive endeavors such as science, health, education, etc. that are discussed in past articles. It will be these limits that will shape the future of global education. The ability to afford a higher education to insure a high standard of living is in itself becoming limiting. To be able to remedy this situation in today’s culture there has to be an increase in the resource base of the poorer communities. In a world with countries fighting over resources and climate change needing an increase in resources to mitigate is it a wise decision to increase the resource base of poorer communities to ensure that when they graduate they have the opportunity to access more resources? This is one of the many educational questions of our time. The lack of opportunity is now leading to rampant opioid use, crime, radicalization, and homelessness. It is our ingrained habitual perception of opportunity and success that is preventing forward motion in our educational needs. If the reason for education could change direction where the academics reinforce the need to learn skills to enable the lifetime learner to live a low resource based lifestyle, society as a whole could spend the remaining resources on endeavors that benefit our global society. Since most of the societal habits are learned through just being part of the culture, in order for such a change to occur the educational institution would have to move toward a school culture that acknowledges a low resource (low throughput) way of living. Being successful would take on a whole new meaning whereby all students are on a level playing field. Through imagination, inspiration and intuition students would increase their academic and physical skill level while at the same time decrease the school’s budget. Beliefs are much like habits in that the more time a person spends believing a line of thinking the harder it is to change this belief. We all find data and facts that support our beliefs and as time goes on we have too much invested to change. One of the beliefs that would have to change for such an educational change is the belief that we have unlimited resources. Our culture trains us to accept this belief to be true. It is true that many may agree that resources are limited but our actions tell a different story. Consider turning all the lights on in a house. When will the lights go dim for lack of electricity? Unless a power failure occurs the electricity is unlimited. The water always comes out of the faucet no matter how much we use, and no matter how often we go to the grocery store the shelves are always full of food. If we actually acknowledge that resources are limited our lives would begin to travel quite a different path. Taking up this idea leads us to another question. If resources are limited, and our actions verify this, should we share resources or not? Of course this is no easy question to answer and even harder to put into practice, however, if we would even want to move in that general direction a low resourced based education could help facilitate such a change. Through education an understanding of how resources are utilized, mined, and shipped would be part of the discussions along with the difference between throughput verses efficiency and other environmental concepts. To make an easier transition to a low resource based education at first might take an additional amount of resources. 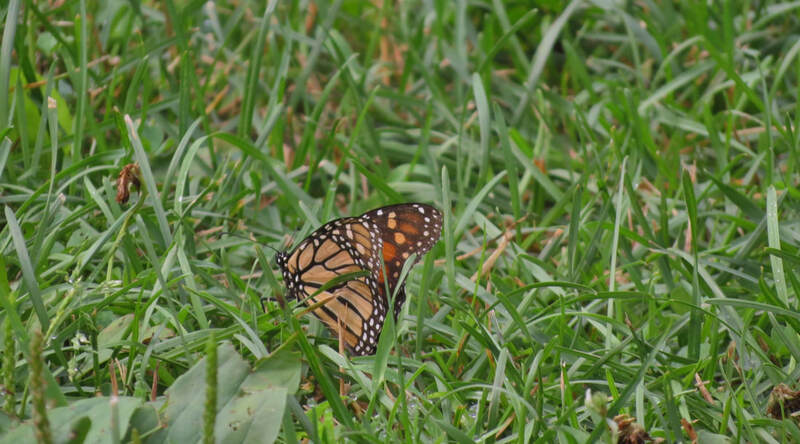 A school that is making such a transition would still need the resources to run the school in the present day high throughput culture while using additional resources to build the low resource infrastructure such as water collection systems, carbon sequestering landscape, and edible forests. As time goes on in a high throughput world, the flow of the resources we all take for granted will start to slow down and the transition will be more painful. It is the affluent class that has the access to the resources necessary to make such a transition. An open discussion is key to successfully forming a vision based on throughput leading to a global cultural shift. 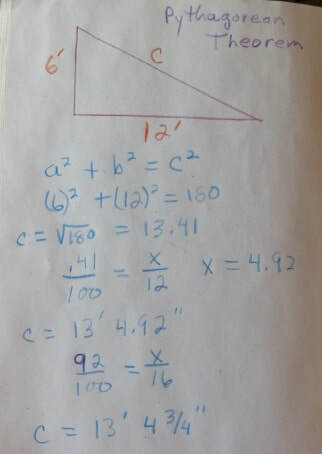 Using the Pythagorean Theorem the hypotenuse of a triangle can be determined. 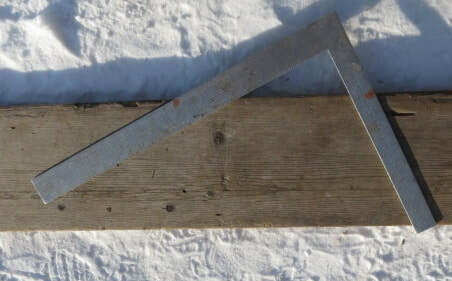 In using a framing square the carpenter can figure out the lay out of a rafter which is no more than a hypotenuse of a triangle. Building a structure can give meaning to the abstractness of math. 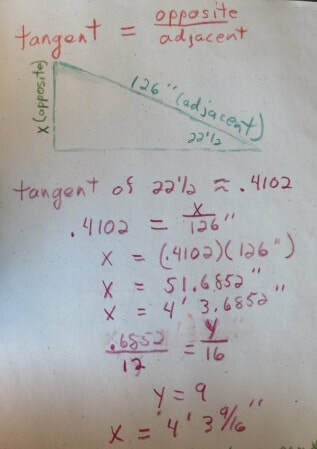 Trigonometry and geometry furthers the magic and practical usefulness of the triangle. Many students find mathematical ideas difficult because they fail to see the practical uses. Working together students could begin to build their own educational institutions utilizing basic mathematical and scientific principles.